We have two new projects to share with the Prairie community. First, the hallways and the SRC are filled with art projects from Mr. Inouye’s seniors in English 12. 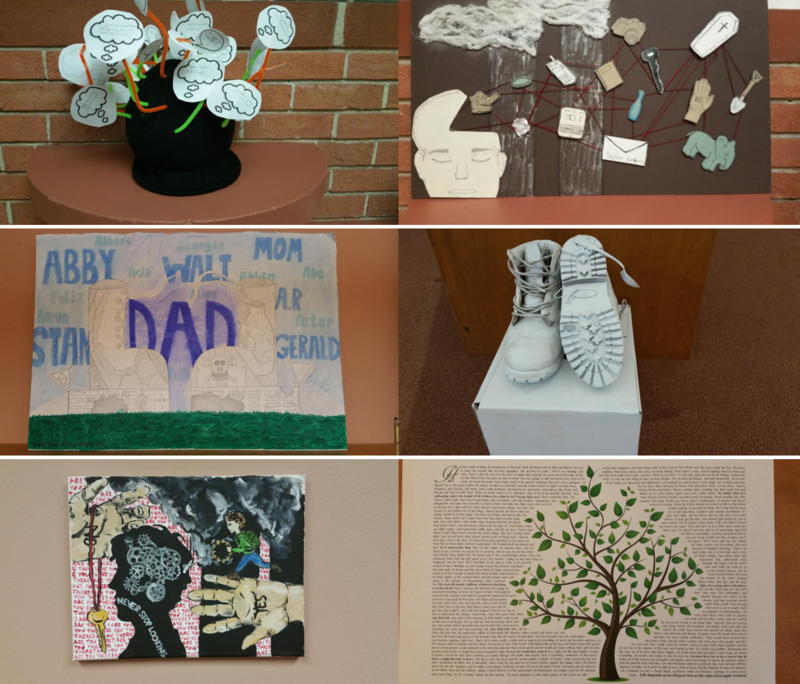 Asked to create artwork inspired by themes in Jonathan Safran Foer’s 9/11-centered novel Extremely Loud & Incredibly Close, students imagined and then drew, painted, sculpted, wrote, and created interactive art for public display. Their artist statements accompany each piece, explaining their artistic vision and methods, as well as the connections they made with the text. Extremely Loud tells the story of 9-year-old Oskar Schell, who loses his father in the World Trade Center attack. Wracked with grief, he finds, quite by accident, an envelope with a key inside and the word “Black” written on it. Given that his father had always encouraged Oskar’s curiosity, Oskar is determined to find the lock that the key opens–and in the process finds the key to his own recovery. Alongside Oskar’s narrative are the painful narratives of his grandparents, whose tenuous and stunted relationship after the bombing of Dresden serve as a foil to Oskar’s active search. The novel’s focus on imagination, literal sculpting, scrapbooking, letter writing, collecting, the creation of physical boundaries, and even a fantastical reversal of all life to before the Big Bang–all of this, and more, led to the creation of this project, which was to interpret (from the Latin interpres, or “translator”) the black and white of the text into something aesthetically pleasing that we can all see, hear, touch, and/or participate in. What could the seniors create that would be of value? That would, in the words of one senior, show that “even in something devastation and depressing, we can can find deeper meaning and beauty through artistic expression”? You are invited to view the artwork and read about the artists’ intents after the Thanksgiving holiday. Artwork is displayed in the hallway connecting the Middle School to the Upper School, in the Middle School hallway, and in the SRC. We hope you enjoy and learn from these talented artists and thinkers! Second, the latest edition of Mindscape, Prairie’s online literary and arts magazine, is live. Staffed by seniors Elena Ganz, Delaney Zaleski, and Ellie Plachinski, the magazine features new work centered around the October theme of “Fear,” plus two new digital flipbooks of poetry from the junior/senior elective Writing Workshop: Poetry and Mr. Inouye’s English 9 students. We hope you’ll enjoy the insightful work of these talented poets, short story writers, photographers, and filmmakers! Stay tuned for more!